This is a piece that was given to us experimentally to re-write. I was slightly more enthusiastic than some and at some point I may continue the story. I hope you enjoy it. The sun failed to slice into the smog lying dense and dirty like some malevolent troll above the pedestrians wending their way obliviously below. Megalithic buildings faded far into the grimy gloom above. Elliot strolled onwards towards Central station, clasping the medallion tightly in his coat pocket. He gloried in its sinister warmth pulsing up his arm to the very core of his self. An insignificant man banged into him turning the corner. The man apologized, running to embrace a pallid woman close to a dismal hotel. Elliot glanced away, focussed entirely on the pull of the amulet in his coat. 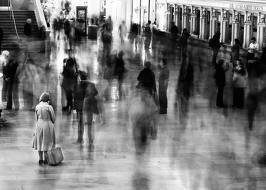 The station loomed out of murk and Elliot listened as his steps clattered on the steps. He breathes in merging aromas of coffee, fish and herbs with the stale unmoving air. Voices intruded on his solitude, an older woman is selling chocolate, yelling incoherently into a crackling microphone. Elliot forced a smile for a bearded man who waved from a neighbouring counter. Market day, surrounded by others, he could dive into his own brooding thoughts unquestioned. In the quiet hours of the night the station’s unwanted denizens scuttle to its subterranean levels for warmth. There, the drunks and city flotsam with nowhere to go, seek oblivion beneath the never dimming lights. The vermin heartened by the quiet slink out of their holes and skitter to feast on the detritus of the day. The Hover-train puttered into sight. As it slowed Elliot became aware of her. A brief tang of her essence reached through the mass of other less pleasant smells and intrigued his senses. The medallion sang to him through his skin but his eyes returned to the girl. There was not much of her, barely fifteen he guessed. Her long hair was filthy and unkempt but the purity of her features shone out in spite of her faded grubby clothes. Incongruously around her neck a small square object glittered from a golden chain around her neck. Music was coming from somewhere, intrusive yet eerie. It filtered through his thoughts and anchored itself deep in his id. The Hover-train clattered to a halt. Elliot glanced at the time noting the train was punctual. Worn-out faces peered through the filthy windows, some pouring out onto the platform as the doors slid open. He screwed his nose up as he entered. The warm air of the carriage reeked of unwashed, unloved bodies and more noxious stenches lurking beneath. He sat where he could see the girl, combing her hair with her fingers into some semblance of order. His eyes drawn to her, he furtively glanced away. The doors slid closed. The train started, moving onwards away from the station. The weary travellers settled down, some dozing as they rattled along. Sleep pushed at him and his eyes flickered closed. But images flooded in unsought. Elliot tried to block those abhorrent memories but they would not be denied. “Take this please,” a melancholy lyrical voice said in his mind. He stared into the girl’s piercing blue eyes. Lifting the chain over her head she thrust it into Elliot’s hand. Her tiny cold hand wrapped his fist around the necklace. She smiled but it did not light her eyes and moved down the aisle out of the carriage. She paused briefly and her eyes caught his. Then she opened the door between carriages. The door shut behind her and she fell sideways into the dark as stunned passengers screamed in horror. The train lurched sharply as someone pushed the emergency button, and came shuddering to a halt. Elliot barely heard the policeman. His eyes fixed down the tunnel unreasonably hoping to see her return to the train. The shrouded stretcher borne aloft by sombre ambulance men replaced reality over his wistful fantasy. “You said that Sir, didn’t you?’ The policeman asked again. “Yes,” Elliott heard his voice answer as if from distant shores. Nothing made sense, the uncanny song, the weird linking to the girl who jumped to her doom or her gift. The necklace was as cold as the medallion was hot and both vied for my attention and comprehension. A young policewoman joined them. She looked cheerful as if unconcerned about the girl’s death. “She didn’t say anything to you at all?” The policeman asked with slightly more interest than his female colleague. The policeman turned to question the other passengers. The policewomen’s deep brown eyes bored into him, then she shuddered and turned away. Would love to read on. Grabbed my attention and held it right through. I could even smell the coffee… Great writing! Well written opening Chapter! It flows and keeps the attention span and plays with your imagination… Would love to read the finished book.. Well done Giselle!